50 grams. 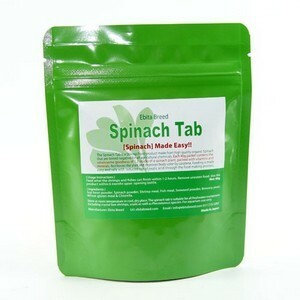 EBITA BREED Spinach Tab is a bee-shrimp food newly developed using organic spinach that is highly packed with vitamins and minerals. Apart from high iron content, EBITA BREED Spinach Tab also contains abundance of Calcium, Vitamin A, C, K, folic acid and carotenoids Beta-Carotene and Lutein. The high content of Chlorophyll aids in the digestion of the shrimps. Bioflavonoid Quercetin that gives Spinach anti-oxidant properties in addition to its many other benefits, helps to improve immunity and reduces chances of diseases. In all, EBITA BREED Spinach Tab contains more than 25 kinds of nutrients, 18 kinds of amino acids, 10 kinds of vitamins and 13 kinds of minerals. Spinach powder, Soybean-derived, seaweed, and barm etc. Feed within 6 months upon opening the packaging. Remove any residual food after feeding. Keep the product in a cool, dry and dark place.